We do occasionally buy single items and collections, so e-mail us with your list! We also consign-Have your own page, or add to ours, We'll even do Ebay for you-email us for our consignment options! if we have something you'd like, and you have something comparable that we'd like! 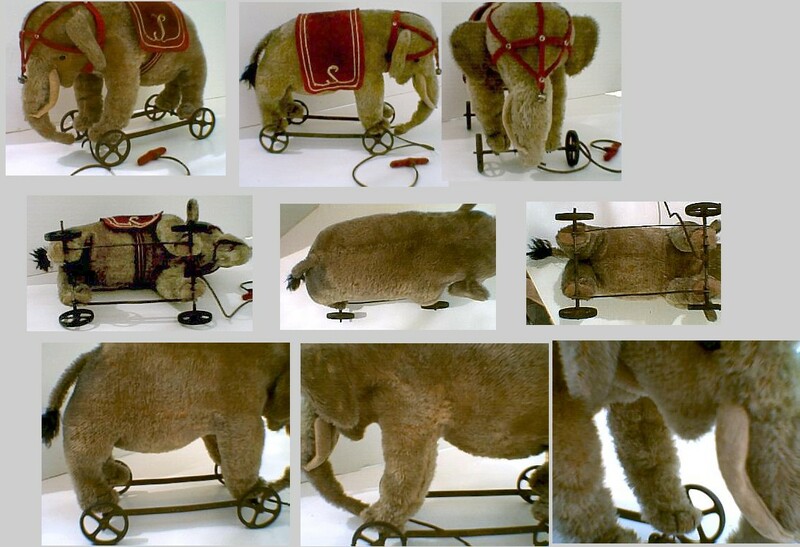 Wonderful early 1900's Elephant believed to be Steiff (see the early Sortiment page 301). This guy does have some fragile areas and has had some restoration. He is a true antique (over 100 years old!) and is a superb piece in amazing condition especially for it's age. Will consider your offer! This includes a multitude of collectible items - not just Steiff and other stuffed! From real antique (100+ years old) to newer collectibles! -SEND US YOUR WANTS-WE MAY HAVE IT! *We will be trying to list more items over the next few months, but for now we are listing just a few choice, and currently consigned items for sale. 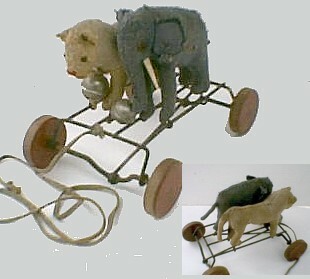 Above is a fantastic Steiff Galop toy. This is one of the rarest. The item was in the program from around 1926 to 1929. ***This item can be restored to any degree you'd like if desired...right now the piece is so rare, and fantastic, and shows how loved it was, that the customer asked to sell as -is and let the buyer decide to do any work or not. 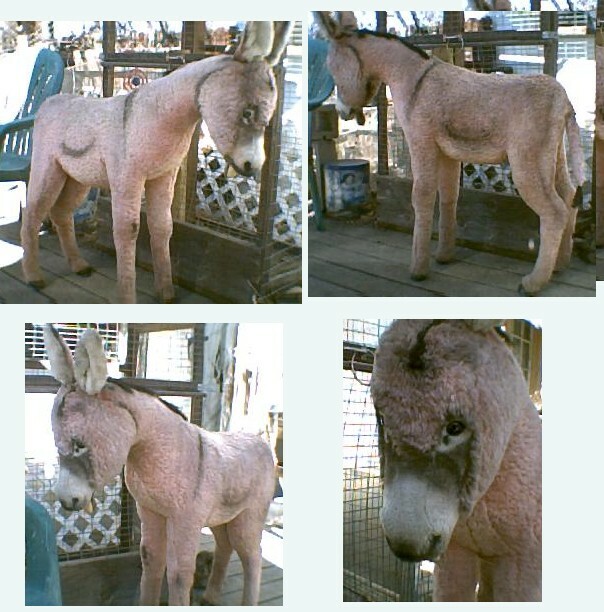 Here is offered a Steiff Draylon, life-size (studio size), baby Donkey. He is not in perfect condition but is sturdy, rideable :), and would make for a fantastic display piece. He did not retain his I. D. And his mane is thinning (must be an older baby LOL). There are a few places where, if you look very closely, someone must have spurred him a little hard, and I do think the tail may have been redone at some time (not by Dr. E. Though...)...He is a nice piece if you like that realism!!! Asking $275.00. He so big it is hard to get pictures but we did our best. E-mail if you'd like more info, or measurements etc. We do have several ride-on animals from early 1900's to the 50's (dogs, horses, bears). And many other animals and puppets etc. Both Steiff and other manufacturers. If you prefer super high end, more pristine, and/or something other than what you see, in Steiff or other style, E. Will sometimes sell items from the private collection -Please let us know what you seek.